With high-end features and unsurpassed sound reproduction, the Audioengine A5N BAMBOO 2-Way Bookshelf Speaker (Pair) will take your home theater listening experience to a whole new level. This elegant speaker was designed for both professional and entertainment enthusiasts with the capability to deliver crystal clear dialog, and tight sound response. The low-frequency drivers are constructed of Kevlar woofers with advanced voice coils and rubber surrounds. This adds unsurpassed rigidity and strength to the 5" drivers. The 3/4" silk dome tweeters are coupled with neodymium magnets, capable of reproducing exquisite highs with a frequency response up to an amazing 22KHz. Custom designed and handcrafted cabinets with high-gloss professional piano finish make this unique speaker a work of art. Furthermore, to minimize unwanted resonances and distortion, this speaker is constructed with thick high-resin MDF walls with extensive internal bracing; the cabinet materials use environmentally-friendly resins and binders. Also, heavy internal sound-damping material is used to reduce unwanted sound reflections inside the cabinet. This speaker offers great features such as iPod charging capabilities, 75W of peak power (each), dual class AB monolithic amplification, dual audio inputs, and a full range of audio frequencies to complement a variety of your audio selections. Its stylish design will complement the newest flat-screen Plasma and LCD TVs in your home theater set-up. If you want a custom built, high-end, well-constructed bookshelf speaker, look no further than the Audioengine A5N. 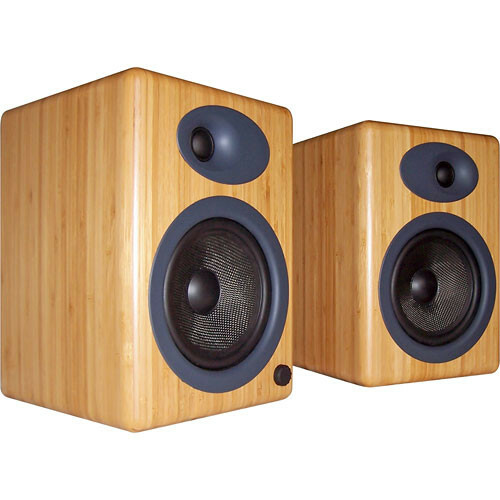 Audioengine's maintains a high-level of integrity when it comes to designing an environmentally-friendly speaker. It's constructed of solid bamboo, 100% lead-free materials that meet the EU's RoHS initiative, limited amounts of plastics, and formaldehyde-free adhesives. Audioengine products meet ENERGY STAR requirements (in standby), and are packaged with easy-to-recycle materials. The low-frequency drivers are constructed of Kevlar woven glass aramid composite material with rubber surrounds. This unique design is capable of eliminating unwanted tonal resonances in the signal path. The end result is a full, clear, tight reproduction of low frequencies. The A5N features ferro fluid cooled, silk dome tweeters with Neodymium magnets. This technology enables an increased dynamic range, resulting in a crystal clear audio reproduction with reduced tonal distortion. Due to its 2-way speaker design and quality cabinetry, this speaker reproduces a full-range of frequencies and lifelike imaging. With a frequency response of 50Hz - 22KHz, this speaker reproduces a full sound range from deep bass tones to ultra-high frequencies. This speaker offers 50W RMS/75W peak power, <50dB Crosstalk, and an amazing 95dB sensitivity. This speaker offers the ability to supply power to the latest generation iPods and most other USB "bus-powered" devices. It is magnetically shielded for safe placement near your TV or display. Box Dimensions (LxWxH) 22.0 x 15.0 x 11.0"